Two Italian tourists have been rescued from the sea in Somerset - after calling a local branch of Boots for help. Oberdan and Patrizia Cosimi, who were on holiday from Pisa, became cut off by the tide while walking along the coast with their dog. Unaware of any emergency numbers in the UK, their only option was to call a nearby Boots The Chemist after they found a shopping receipt in a pocket with the telephone number on it. Boots shop worker Pat Asquith told received the call - but at first thought it was a hoax because of their accents and the bad phone line. However, she soon realised the pair were in trouble and dialled 999 to get help for the couple. Speaking to The Guardian newspaper, Ms Askwith said "The problem was that the gentleman was on a mobile phone and they were right by the water so it kept breaking up. "They kept saying SOS and telling me that they were stuck on the rocks and the tide was coming up.... It was clear that they were really distressed." The couple was eventually airlifted to safety in a Sea King helicopter, and visited the Boots store to thank Ms Asquith for saving them. The rescue is the latest in a series of incidents involving tourists getting into trouble on UK beaches. 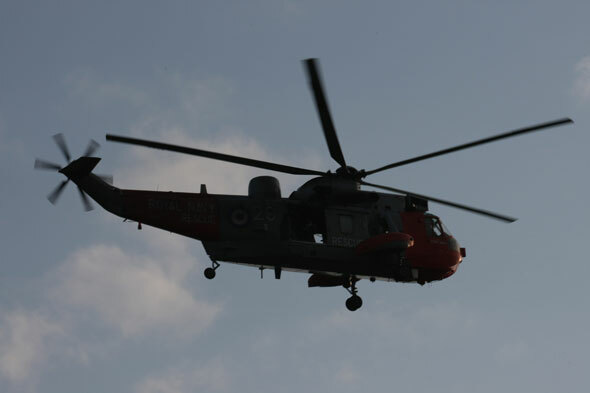 Last week, a young boy was rescued by a lifeguard after being caught in a rip tide in Devon, while in Dorset, a man was winched to safety after swimming in dangerous waters off Chesil beach.